Demand for fresh water is growing rapidly worldwide, making it an increasingly scarce resource. 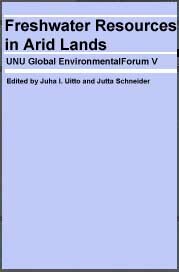 Arid lands today cover over a third of the Earth’s land surface, but a disproportionate share of them can be found in Africa, the Middle East and the interior of Asia. Scarce water resources limit the potential for agriculture and development, cause serious environmental problems, and can become sources of conflict. This book concludes that efficient management of the demand for water is as important as the improvement of water supply. A more economical use of the limited freshwater resources is seen as essential for achieving sustainable development. Juha I. Uitto is with the Global Environment Facility (GEF) Secretariat in Washington, D.C. Jutta Schneider is a hydrologist in Kanagawa, Japan.